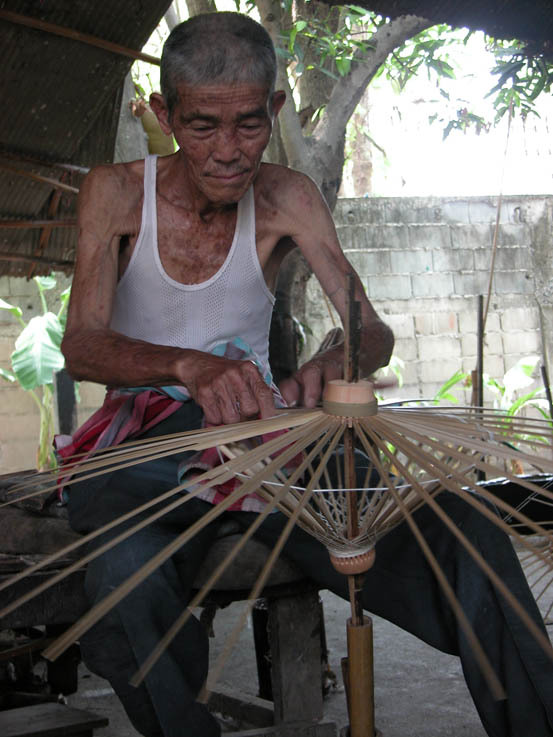 A very experienced umbrella maker, Chiang Mai. The evening after our zoo day, we had a wee party on our verandah. I had decided that a bottle of gin was in order, so I went and bought one at the 7/11 (otherwise known as a Dairy in NZ) for 260 baht (or about $12.60 NZ). Chow, Gill myself and a Phillipine girl called Lyn swanned about with a guitar, some gin and whiskey and several buckets of ice. Very civilized. Chow and Lyn put a sand lizard on the ground by my foot, thinking to scare me, which didn’t work at all, to their great disappointment. Gill suggested quietly to me that I should go and get my scorpion and do the same back, which worked a treat. When Lyn spotted it, we both jumped back and climbed on our chairs in horror (this was at night time, so the light was working in our favour) and she was totally taken in, poor thing. I think she had murderous intentions towards us for a little while after that. Chow then passed me a fancy whiskey bottle that had a cobra inside it with a large scorpion in its mouth. He was lucky I didn’t drop it! He then told us that the cobra would have been put in the bottle when small, then the scorpion dropped in once the snake was bigger, then both of them drowned in whiskey. We couldn’t believe the cruelty of it! And in a Buddhist country? But for some people, dollars speak a darn sight louder than morals. I also really hate seeing the insects set in resin or in frames at the markets. They’re pretty impressively sized bugs, but I refuse to support such a practice. Every time I see this I shake my head at the person selling them. I have to say I’ve seen a lot less of this than I saw in Bangkok in 2005. Maybe more tourists are refusing to buy them. I hope so. Okay, stepping down off my soapbox, last night we went for food in our favourite cafe again, where you can get a nice Thai meal for about $1.25NZ. At cafes here, they serve their food takeaway in cellophane bags, which are then puffed up a bit with air trapped in them and rubber bands are put around the top. Many Thai people buy their dinner this way and a lot of snacks, like potato chips and nuts are sold this way also. Across the road from us was a traffic light. When the light goes green for pedestrians, the light counts down from ten to zero, which doesn’t take long at all. You have to scuttle across the road rather than walk. Last night we went in search of the Pinte Blues club which is mentioned in our second-hand Rough Guide to Thailand that I bought in Bangkok. (We never take this with us – we consult it in our room then take notes in a tiny notebook. There’s nothing like a falang with a guidebook to yell to the locals ‘I’m new here and I don’t have a clue. Come and rip me off!’) Nobody around our area had any idea about this blues bar, which has been here since 1985! We kept walking along Moonmaung Road (just round the corner from our guesthouse) until we found it – not actually very far away, close to a piece of Old Chiang Mai Wall. First we spotted the neon sign, then we saw an awesome Harley Davidson sitting at the curb outside it. This Harley had 4 saddlebags, a large American flag hanging off the back and every part of it that didn’t consist of steel had studs in it. We stopped, gawping like idiots, then spoke to the owner who sat beside it. At first we couldn’t make out whether it was a he or a she, as he/she’s voice was very deep, and was dressed in black t-shirt and shorts, white socks and sandshoes and a fuzzy white hairstyle. Considering some of the falangs we see around here, this gave us no clues whatsoever. It wasn’t till we sat down and watched for a while that we figured out, due to anthropological observation, that this was indeed a She. After a few drinks, and many times fending off Hill-tribe women with – yes, wooden frogs – and flower sellers, our Laughing Tuk-tuk driver pulled up close by (we seem to be a magnet to this guy – and no, he hadn’t seen us yet) and I sent Gill home with him. I then went and had a chat with the Harley Davidson Rideress. I was dying to know what her story was. Turns out, was was a chief engineer for Hilton Hotels for many years, then adopted a Thai daughter and has retired here in Thailand. It took her every day for 5 years to decorate this huge bike, which she rides all over Thailand on. We sat on the street chatting (I love how they just put chairs and tables out on the road here and the traffic just roars past, weaving around you) and then she started her bike, which as it turned out was lit up with LED lights more busily that your average christmas tree, her dog leapt up onto the back seat, she turned her stereo on so it blasted out George Thoroughgood and off she blasted. If you sit still long enough around here, everything will come to you. Flower leis, alcohol, food vendors with entire shops hanging off the side of their scooters, wooden frogs, beautiful Thai women in skyscraper shoes, lizards, dogs, etc. Thai dogs are very good at riding on scooters. They have terrific balance and ride like naturals. There are no parking meters. You just squeeze in wherever you can. Somehow it works. There are little sprayjets of water hanging down over the streets and sometimes rows of fans spurting out larger sprays to keep people cool. Bridges here have cool statues of elephants or whatever on them. Traffic police somehow manage to blow whistles even thought they wear masks over their mouths. Thai people love fish and the vendors keep them swimming around live then chop their heads off and cook them for you. They also love loud music and kitchy dancing groups doing strange jerky movements on television. Today we hired Chow and the guesthouse car for the day and went outside the city to Sunkompang Village. This cost us 300 baht ($15NZ), which when split between us, worked out a darned sight cheaper than a tuk-tuk would have. We felt like royalty having an actual car and a driver to ourselves. We went out to an umbrella-making factory and watched how the process is done. When we got to the umbrella painters, Gill got her handbag painted with butterflies and I got a Ganesha (elephant god) and an Om sign painted on my camera case. They wanted to paint my bag, but I explained to them that it was made in India and would last a lot less longer than the painting on it. We then went to a silk-making factory where you can watch the entire process from the moths mating, to the worms eating mulberry leaves, to them making cocoons to the cocoons being boiled (ugghh) to the silk bobbin winding and weaving on the looms. We were then led into a shop in which the prices nearly made me eat my tongue in fright. I went back out to the factory and played with a pop-ball with a boy in there who had to stick around his mum, who works one of the looms, all day. He was a nice young guy, aged about 11, and I gave him the pop-ball so he had something to do while he was hanging around. He loved it, and his mum was pretty pleased too, so that, as well as seeing the silk-making process made the visit worthwhile for me. Next, we walked over to a factory next door where they made jade products and jewellery. There was a multitude of women there to serve us and no other customers. Once again, we were shadowed so closely they were almost tripping over us. So far, these factory/shops were charging like wounded bulls for their products – by our experience, about four times what you could buy the same stuff for in the markets. But then you see huge, flash tourist buses full of falang pull up outside and you see how they get away with it. They had a lot less luck with the two part-scottish kiwis who wandered around taking photos and drinking their nice cold FREE water. Chow then took us to a Thai Antique place. Yeah right! It was run by Kashmiri guys who featured mostly Kashmiri carpets and stuff from Rajasthan and other parts of India who I think were a little put out that I recognised a lot of it for what it was. However, the guy running that particular show had promised Chow 400 Baht just for taking us to the door, so we were happy to go through the motions to help our Thai mate out. Finally, a wood-carving factory. We got herded through there like cows late for milking because it was nearly closing time for the workers. 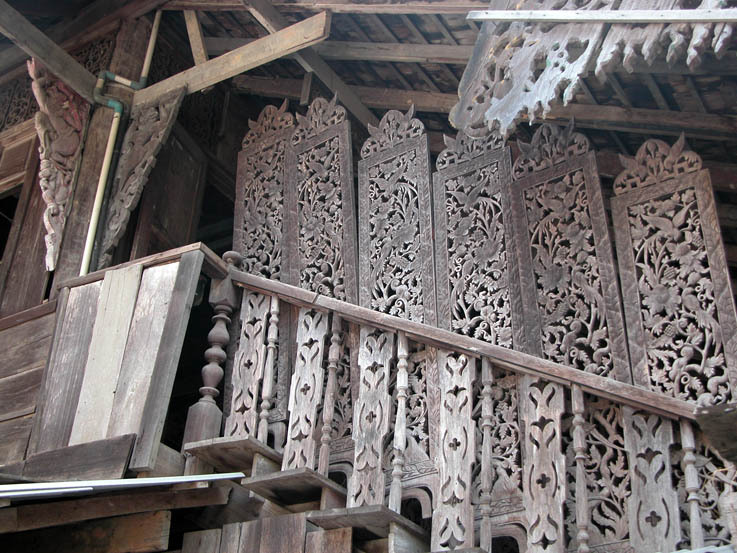 Out the back they had a huge teak trunk and another huge rosewood trunk drying ready for carving and various and sundry bits of furniture and carvings, once again with terrifying prices. When we were pushed back out the front to the showroom, I was looking for something small enough to afford and found myself once again being followed around. By this stage, I was in a ‘Get Mad or Get Even’ sort of a state and Get Even won out. So every time I felt the serving girl behind me and heard her draw a breath to give me a selling spiel, I’d move forward a few steps then stop. She would do the same thing, then just as she was about to speak, I’d move forward again. I don’t know about her, but I was actually starting to enjoy this game and started to quietly get the giggles. It was like going shopping with Inspector Clouseau (enter Pink Panther music). Childish, I know, but it was either that or tell her where to go and how to get there, so I was just taking the politest option. Finally, we went back home, via the train station to buy our ticket back to Bangkok in a few days time, and staggered back to our room. Gill is now asleep and I’ve imbibed in two very warm gin and Sprites (my left arm for some ice!) and am thinking about a nice cheap dinner. Yay for living in cheap neighbourhoods. 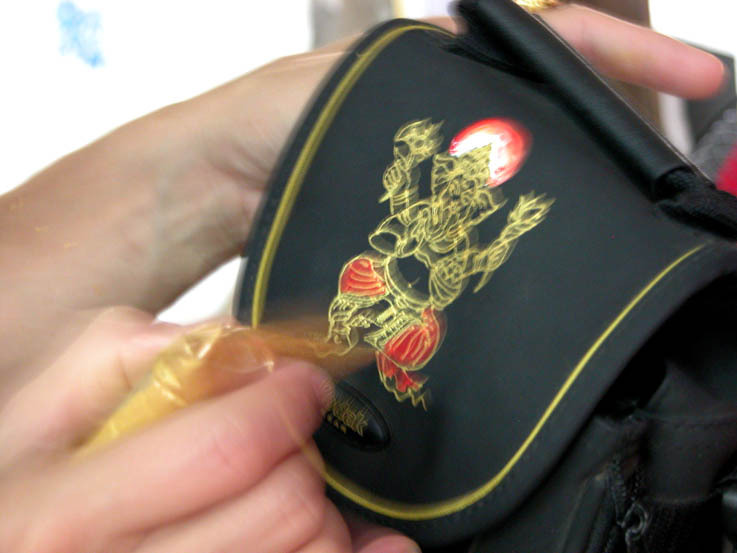 My camera bag being painted at the umbrella factory, Chiang Mai. 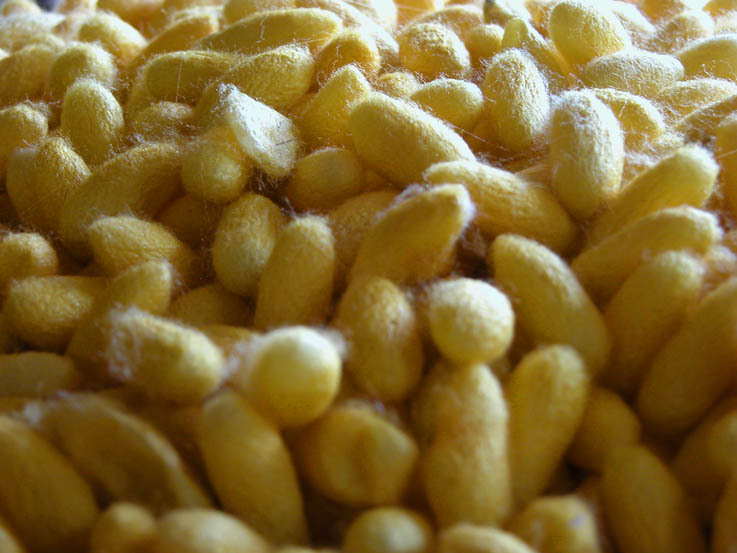 Silkworm cocoons up close. Chiang Mai, Thailand. Wooden lace at a house next to the carpet shop, Chiang Mai. 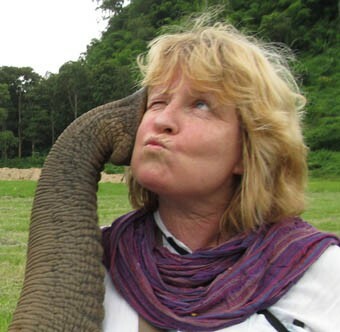 This entry was posted in Ravings - random wafflings, Ravings on Thailand and tagged Chiang Mai, crafts, factory, gin, guesthouse, Harley Davidson, lizard, party, scorpion, silk, snake, Thailand. Bookmark the permalink.